This unit is designed to integrate with your existing hair. It is ideal for someone with some balding or thinning on the top or crown area. The unit can be clipped in place. If the crown area is experiencing complete baldness the clips can be removed and the unit can be taped to the scalp. ◣Overall lengths available 10"-24" (measuring from the crown). ◣3 Clips hold this unit in place. 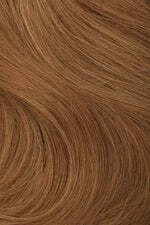 ◣ Remy (cuticles intact) double drawn fine 100% human hair. ◣ Hair texture: Available in straight or wavy. 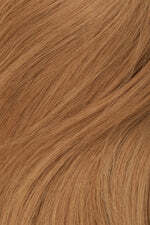 Wavy: Dries naturally wavy but can also be blown straight or hold a curl using heat styling tools. 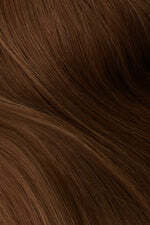 Straight: Dries naturally straight but can also hold a curl or a wave using heat styling tools. ◣The perimeter of the unit has 1/4" wide poly lining so it can be taped on to a bald scalp. ◣Hair vented at hairline for an undetectable finished look. ◣10 Day Money Back Guarantee. 1 Year Warranty.